Among the most popular and interesting places to visit in Kiev Pirogovo museum is always in top ten. 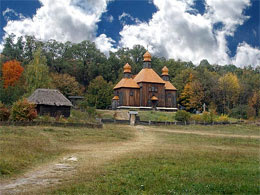 Pirogovo – is an open air museum situated on the outskirts of Kiev. Museum was built as an original Ukrainian village in very picturesque place. When visiting Pirogovo museum you even loose the sense of being just near the big city. Museum represents the daily life of Ukrainian villages of 19-20th centuries in different regions of Ukraine. Pirogovo museum is the biggest skansen type museum in Eastern Europe. It’s a unique place because all the expositions on the territory of Pirogovo – traditional houses, windmills, blacksmith house, tavern and many more were the authentic buildings brought here from all over Ukraine. If among the many tours of Kiev you decided to visit Pirogovo we recommend you to spend there not less then 3-4 hours. Except discovering Ukrainian ancient daily life, you will for sure enjoy the surrounding nature of museum – beautiful small lakes, green hills – so typical landscape for Ukraine. And of course you should taste Ukrainian cuisine in one of the taverns – “shynok”. Salo, varenykyy, borscht – this will be the great ending of your small trip to Pirogovo museum.